What are standard kitchen dimensions? Actual kitchen dimensions might vary from very tiny with a few standard kitchen cabinets to larger sizes with a convenient 20 – 25 square feet kitchen island in the middle. There is never a standard dimension of kitchen but rather limitations by what can be afforded. Many apartments as well as smaller single family houses have compact to medium kitchen and 10’ x 10’ might be found as a perfect measurements to satisfy essential requirements of smaller families. But in bigger 2,900 – 3,400 ft² custom homes 17 x 17 feet kitchens with another 130 square feet open dining room area will be a good and convenient solution. Layout is an important factor in determination of practical usability of a whole kitchen. Placing cabinets on a two perpendicular walls, forming L-shape, will create a spacious open area in the middle of a room with a possibility of accommodating even a dining table aside. Installing 7 – 8 standard cabinets from the corner might be the only solution if the space is tight with not much possibility for expanding. U-shaped kitchens have to have at least 6’ long walls allowing enough space for cabinets and still wide enough walkway in between. But many bigger kitchens designed with an island in the middle and kitchen cabinets from three sides whether restricted by walls or only with a base cabinets installed from one or two sides leaving the space in between countertop and ceiling widely open. Kitchen islands typically 24” wide with a length defined according to a particular design and style. Island counters very often have 12” – 16” overhung from a longer side making it more convenient to place chairs under and use it as an eating area. While designing or planning on expanding existing kitchen consider type of kitchen appliances which will be used. Standard openings for a dishwasher, refrigerator and oven should not only be added as extra spaces but rationally organized for convenience of usage. 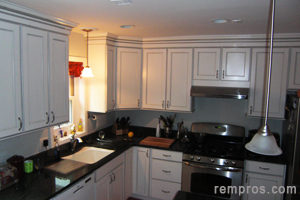 Build – in appliances might require ordering custom cabinets with cut-outs made according their dimensions. While creating a kitchen design custom made cabinets are much superior option, but due to lower cost standard sizes might be more preferable. Stock cabinets typically available in width with 3” increment beginning from very narrow 9” wide and up to 36” or even bigger. Professionally installed fillers will make standard cabinets adequately fit in the room with any measurements. Average or standard might be not proper terms in defining which size of a kitchen will be ideal because many factors might restrict or limit the possibility of creation desire dimensions in the existing home. But while planning to build a new house or home addition the possibilities in design are endless. Many homeowners might found a 150 square feet U – shaped kitchen with 16 – 18 wall and base cabinets just a right size to meet family needs. At the same time, other family might found such dimensions considerably small and require more space to satisfy their requirements while preparing meals in the busy kitchen.